Photographs of inmates of the imbecile asylum. Media, Pennsylvania : sans name, sans date (ca 1867-1875). Photographs : 68 albumens mounted on cards. Repository : National Library of Medicine, History of Medicine Division. Subject : Asylums — Portraits of mental disability. Dr. Parrish, although best remembered for his studies in the care of inebriates,1 is of significance to medical photohistorians because he was associated with (1) the preservation of the "imbecile asylum album" and (2) the first medical book with actual photographs.2 He clearly saw the value of the photographic image, and further research may show that he was instrumental in having the pictures taken, since he was in charge of both institutes. Lacks title page, no other copies known. Donated to the National Library by Parrish in 1886. 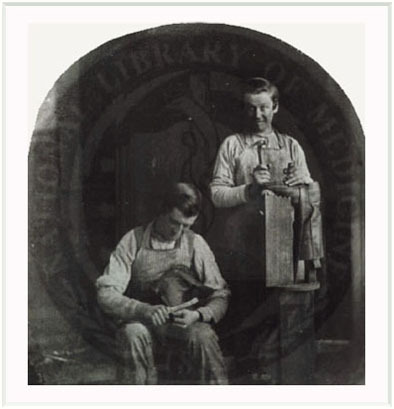 NLM catalogs Parrish as the author/photographer. NLM lists Burlington NJ as the site of publication. Publishing date and location provided by the National Library of Medicine is disputed by Dr. Stanley Burns (op. cit.) who suggests it is more likely that these are portraits of inmates at The Pennsylvania Training School for Feeble-minded Children at Media, Pennsylvania. There is a considerable amount of evidence to support his supposition. Parrish was appointed superintendent of the school in 1857 and immediately initiated a fund raising campaign that was publicized by Isaac Newton Kerlin in a book titled, The Mind Unveiled. Clothing of the inmates appearing in photographs illustrating Kerlin's work are stylistically identical with the clothing worn by the subjects of Parrish's album. However, Parrish left the Training School in 1864 to join the U.S. Sanitary Commission during the Civil War, and at the time of his departure there were probably fewer than 50 inmates registered at the school, ten of them from the rebel states. Parrish's album represents 86 inmates, 64 males followed by 22 females, and includes images of a few young adult men and women. It was not until the middle 1860's that the first patient population had reached adulthood at Media. Now under the directorship of Dr. Kerlin who took over from Dr. Parrish, the school allowed the most unemployable adult inmates to stay and work the farm. If, then, the Parrish album portrays inmates of the Pennsylvania Training School, it was probably after the end of the Civil War in 1867, the date the population first approximated 150 inmates. The photographs illustrating The Mind Unveiled are salt prints whereas the Parrish images are albumens, all but one of them cut into the shape of an arch which was a popular format after the Civil War and during the early 1870's. My guess is that the Parrish album dates between 1867 and 1875. I concur with Dr. Burns that the subjects are inmates at The Pennsylvania Training School, but it is a mystery when the album came into the possession of Dr. Parrish. After the war, this remarkable physician specialized in alcohol addiction and he returned to Media Pennsylvania to build one of the first treatment facilities for inebriates in the country. He remained at Media until 1876 when he resettled in Burlington New Jersey and took charge of a home for nervous invalids, and where he established another treatment facility for alcoholics. He remained very active politically, serving on several national and international medical committees, particularly when it involved the temperance movement. Parrish also authored a number of works including the first textbook on alcohol addiction. The subjects of his album are almost all children and it is not possible that they were inmates at his inebriate asylums in Media or Burlington. It is also unlikely that they are patients from the Burlington home for nervous invalids which was probably custodian to a small population of rare nervous system disorders such as the cerebral palsy that seems to be manifested by the boy of Plate 3. Nor is it possible that these are patients of Burlington County Insane Asylum in New Lisbon which did not break ground until 1875. Photograph courtesy of the National Library of Medicine, all rights reserved. After the Civil War, The Pennsylvania Training School was in debt including $11,000 defaulted for the care of children from the south. I have no doubt that Dr. Kerlin began his fund raising by soliciting his friend and preceptor Dr. Parrish, who was politically empowered from war years spent in service to the White House and to State Legislatures of the Union. Kerlin would have made certain that Parrish carried a copy of the imbecile asylum photograph album under his arm as he received visiting dignitaries or lobbied state legislators. There are only two occupational photos in the album, a peculiarity for what is supposed to be a visual representation of a training school. Besides the two cobblers depicted in Plate 29, there is also a group photo of three men wearing protective overalls and standing with arms crossed in Plate 12. However the lack of occupational images supports the dating of the album to postbellum years at the school. Many of the children shown are still too young to practice a trade and only under the stewardship of Dr. Elwyn beginning in 1870 did the school become known for its vocational training. In 1875, fund raising began for the construction of "North Hall," a facility where inmates could learn to make brooms, manila rope, and corn husk mats. Dr. Kerlin returned to the School that year to participate in the capital project, and he lobbied the Pennsylvania State Legislature from 1875 to 1876. It is again plausible that a photograph album was brought along to press the cause and it would have held an occupational photo of inmate cobblers because plans for North Hall included rooms for the asylum's burgeoning shoe repair service. 1 Parrish, J., in Kelly, H. A., and Burrage, W. I., Eds., Dictionary of American Medical Biography ; New York : D. Appleton and Co., 1928, p. 942. 2 Kerlin, I. N., The mind unveiled, or: A brief history of twenty-two imbecile children ; Philadelphia : U. Hunt & Son, 1858.